(Native American Church of Nemenhah). Our Mission is to Restore the Sacred in Natural Healing and to provide a Safety Net under Title 42 of the U.S. Code. We concentrate our efforts in the Healing of the Individual, the Family, the Community, the Society, and ultimately the Planet. This is the “Five Fold Mission” of the Nemenhah. We offer an open invitation to all Natural Healers of Good Intention. 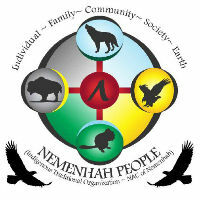 If you are willing to publicly declare that Natural Healing comprises part of your Spiritual Orientation, that you will First Do No Harm, and that you will endeavor to further the work of perfecting and unifying the Nemenhah and the fulfilling of its mission, promising your support for its services and offerings, you are invited to become part of our Permanent Population through the Ancient Nemenhah Principle of Spiritual Adoption (the Making of Relations). *This website and its services are facilitated by donated time and resources and is, therefore, subject to constant update and modification. If there is anything amiss with the pages or links contained herein, please let us know immediately.